Commenting on today's sheer market chaos as the US and UK return from holiday, Bloomberg writes that "fixed-income markets have descended into panic amid mounting concern over the risk of Italy leaving the euro or leading to its break-up" and while Italy is suffering the biggest losses in peripheral debt, core bonds and Treasuries are spiking higher. For those who stayed away from market news over the holiday weekend, this is what happened and why we are here today: Italy PM-designate Conte gave up on efforts of forming a government after Italian President Mattarella rejected Eurosceptic Paolo Savona for the Economy Minister position because the appointment would have “alarmed markets and investors, Italians and foreigners" (yes, very ironic in retrospect, although just as we predicted would happen). Mattarella then summoned former-IMF senior director Cottarelli to meet in a move viewed by some as laying the groundwork for a technocratic government. Forza Italia said they would not support this government, and 5SM and League set their sights on the now highly likely new elections (touted from September 9th). Both 5SM and League saying they will evaluate their coalition in these new elections. Meanwhile, on Sunday Italian President Mattarella gave a mandate to form a government to ex-IMF official Cottarelli, while PM-designate Cottarelli accepted the mandate and sees elections at the start of next year. In related news, League leader Salvini said he hopes there will be a government in October for the approval of the budget law and to avoid a VAT increase and M5S leader Di Maio wants elections as soon as possible, while Forza Italia’s Berlusconi said his party will reject the Cottarelli government. At the same time, the Spanish Parliament started the process for a no confidence vote against PM Rajoy, while it set the date for debate and vote of confidence on PM Rajoy's government for May 31st and June 1st. In short: for those who missed the crazy, volatile days of 2011, here is your change to relive them, and here is the mandatory sea of red to go with it. But what is different this time, is that while the risk-off sentiment is spreading across risk assets around the world, with Italy and Spain leading declines in European stocks and U.S. equity-index futures also sliding amid soaring contagion fears, with the euro also slammed below 1.16 pushing the yen and USD higher along with gold, it is unclear just what the ECB can do this time, which back in 2012 unleashed the threat of "whatever it takes" to halt the last Italian collapse. 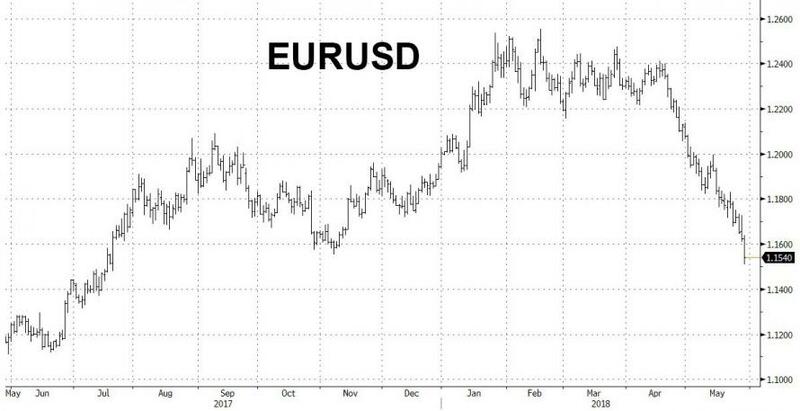 Well this time, "whetever it takes" has been running non stop since July 2012, and the ECB is rapidly running out of bonds to monetize, so it may well be that we are finally approaching the end of the European experiment, unless of course Draghi gets a greenlight from Merkel to start monetizing everything - stocks, bonds, and anything else that is not nailed down - in hopes of stabilizing markets. And before it is all over, he will, just as Europe will file criminal charges against those who dare to short Italian bonds. 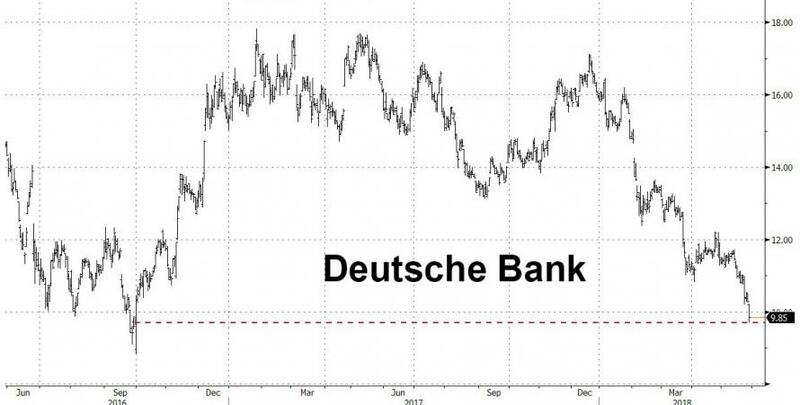 For now, however, as we showed earlier, Italian bonds are crashing with 2Y yields plunging the most on record, Italian-German spreads exploding, Deutsche Bank stock tumbling below €10 for the first time since September 2016, and Italian bank CDS blowing out. 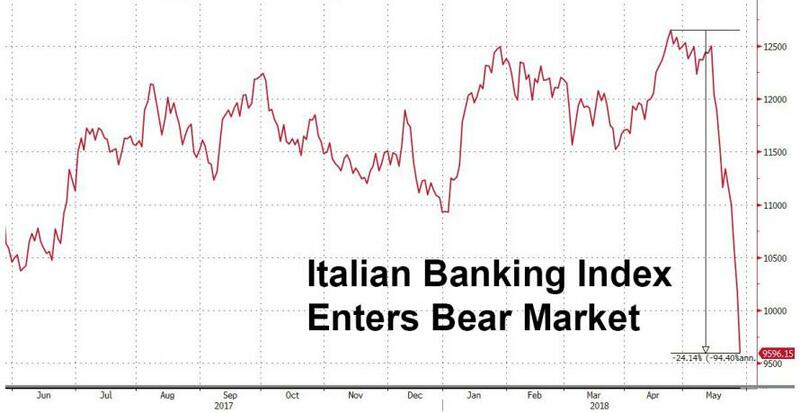 ... with Italian banks now in a bear market. As Italian banks continue to bleed, trading has been periodically halted in Monte Paschi (-4.5%), Bper (-5.4%) and Banca Generali (-3.0%); all limit down. ... while the Stoxx 600 has fallen to an almost four-week low and is again trading below the level at the start of the year. In fact, all major European benchmarks are also now in the red for 2018, except France’s CAC 40. Even more important, the declining euro isn't acting as a cushion for exporter-heavy indexes like the DAX, which is also heavily in the red today. In short, everyone is only focused on one thing: Italy’s domestic politics. As a reminder, Italian President Mattarella yesterday gave a futile mandate to ex-IMF official Cottarelli to form a technocratic government. Cottarelli’s list of Ministers is expected to be unveiled today, moving the process to a vote in the Italian parliament (League, 5 Star and Forza Italia have majority) where a snap election - now also dubbed a Euro referendum - appears inevitable. The question now is what the ECB will do: not only how will Draghi stem this outright liquidation of everything Italian, but whether the ECB's tapering plans are now indefinitely postponed, and/or whether it is time for even more QE. 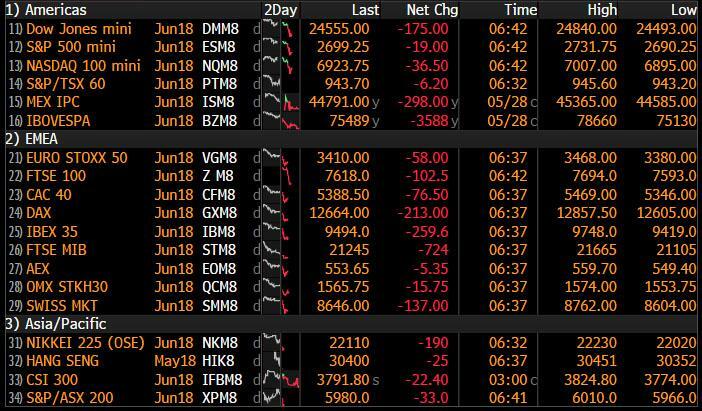 While Europe is once again a basket case, Asia traded mostly subdued as the region lacked impetus following the market closures in US and UK, while recent weakness in oil prices and political uncertainty surrounding Italy and Spain have added to the cautious tone. Nikkei 225 (-0.6%) was the worst performer as Japanese exporters suffered from flows into the JPY, while Japan Display shares led the declines in Tokyo with losses of over 20% seen in early trade after reports that Apple is to switch to OLED screens on all iPhone models from next year, which in turn underpinned South Korea’s LG Display. ASX 200 (+0.2%) was lifted by strength in its largest weighted financials sector and as energy names shrugged off the recent aggressive pull-back in crude prices. Shanghai Comp. (-0.5%) failed to maintain the early support from a firm PBoC liquidity operation and eventually slipped amid the broad risk-averse tone, while Hang Seng (-1.0%) was weighed by losses in blue-chip property and energy names. ... the yen rallied against all G10 peers with USDJPY dropping to a one-month low; the Swiss franc was the other top performers while the U.S. 10-year yield fell to the lowest level in almost seven weeks as it played catchup to the sharp rally in Treasuries futures over the holiday. Scandinavian currencies were the worst group-of-10 performers, weighed down by the souring risk global sentiment. Meanwhile, the pound fell to a fresh 6-month low against the dollar with Brexit uncertainty continuing to weigh on the currency amid a broader risk-off trend. In geopolitical news, President Trump tweeted that a US team arrived in North Korea to make arrangement for summit between Trump and Kim Jong Un. South Korea President Moon met with North Korea leader Kim in an unannounced meeting over the weekend in which the latter affirmed commitment for denuclearisation. On Monday, the WSJ reported that the US is said to prepare new sanctions push against North Korea although reports later stated the US is to hold off on sanctions for summit talks, while South Korean press reported that US is said to demand that North Korea ship out its nuclear weapons and missiles. In Brexit news, EU Negotiator Barnier said on Friday his scenario is to reach a realistic Brexit deal and that his worst-case scenario is not a no deal. On Saturday, Barnier warned the UK to stop playing ‘hide and seek’ and come to a realistic solution for their exit from the EU. Elsewhere, WTI crude continues the declines seen on Monday trade (-2.0%) as traders continue to digest a possible OPEC+ production increase next month. Spreads are widening between WTI and Brent futures, with Brent currently up slightly on the day (+0.2%), as a result of a different settlement date for Brent. In light of Europe's repeat crisis, it is probably not a surprise that Gold is currently trading higher and has broken the USD 1,300/oz level as safe-haven demand is proving some support for the yellow metal. Copper prices are seeing strength after the closure of an Indian copper smelter is cutting supply to the market. Steel rebar is higher as Chinese seasonal demand has grown. Expected data include Conference Board Consumer Confidence and Dallas Fed Manufacturing Outlook. Bank of Nova Scotia, HP Inc. and Salesforce.com Inc. are among companies reporting earnings. Spain’s government nominated Pablo Hernandez de Cos to head the country’s central bank, backing a fiscal conservative for a job that includes a say in European monetary policy. Asia traded mostly subdued as region lacked impetus following the market closures in US and UK, while recent weakness in oil prices and political uncertainty surrounding Italy and Spain have added to the cautious tone. As such, Nikkei 225 (-0.6%) was the worst performer as Japanese exporters suffered from flows into the JPY, while Japan Display shares led the declines in Tokyo with losses of over 20% seen in early trade after reports that Apple is to switch to OLED screens on all iPhone models from next year, which in turn underpinned South Korea’s LG Display. ASX 200 (+0.2%) was lifted by strength in its largest weighted financials sector and as energy names shrugged off the recent aggressive pull-back in crude prices. Shanghai Comp. (-0.5%) failed to maintain the early support from a firm PBoC liquidity operation and eventually slipped amid the broad risk-averse tone, while Hang Seng (-1.0%) was weighed by losses in blue-chip property and energy names. Finally, 10yr JGBs were higher amid recent upside in T-notes and declines in US yields, although the gains for Japanese bonds were only modest amid a mixed 40yr auction which printed a higher b/c but lower prices from previous. In FX, the JPY benefitted most among G10/major currencies from the latest political turmoil in Italy, and to a lesser extent Spain, that has sparked broader risk-aversion and fresh EUR losses to ytd lows, around 125.05 for the cross and circa 1.1510 vs the USD, with very big barriers at 1.1550 breached. In terms of the DXY, the aforementioned Eur slide pushed the index to a new 2018 peak around 95.030, even though Usd/Jpy has retreated further below 109.00 and through a 108.79 Fib to test bids/support around 108.50, but with decent option expiry interest sitting between 108.80-90 (1.2 bn) perhaps limiting downside price action approaching the NY cut. GBP also a fall guy, partly in sympathy with the single currency, but also amidst yet more uncertainty over Brexit and of course UK political unrest, with Cable down through 1.3250 and almost hitting 1.3200 after taking out channel support at 1.3221, albeit briefly. CHF consolidating gains vs the Usd in the low 0.9900 area, but extending advances vs the Eur through 1.1500 and within striking distance of the 1.1447 ytd base, as a prominent US bank goes short for 1.1200 and places a stop at 1.1700. NZD/AUD/CAD: Less pronounced moves, but all weaker for choice of risk-off positioning with the Kiwi around 0.6925, Aud/Usd near 0.7530 and Loonie circa 1.3000. TRY: Bucking the overall trend and clawing back more losses as the Lira derives comfort from moves by the CBRT to simplify its monetary policy operations via officially targeting the 1 week repo rate. Usd/Try currently around 4.6000 vs 4.9000+ less than a week ago. In commodities, WTI is continuing the declines seen on Monday trade (-1.4%) as traders continue to digest a possible OPEC+ production increase next month. Elsewhere, gold is currently trading upwards and has broken the USD 1,300/oz level as safe-haven demand is proving some support for the yellow metal. Copper prices are seeing strength after the closure of an Indian copper smelter is cutting supply to the market. Steel rebar is higher as Chinese seasonal demand has grown. Looking at the day ahead, the main highlight in the US will be the May consumer confidence report, while the May Dallas Fed manufacturing activity index and March S&P/Case-Shiller home price index data are also due. Away from that, the OECD conference is also due to kick off (through to Thursday). On paper yesterday should have been one of the quietest trading days of the year with both the US and UK out on holiday. 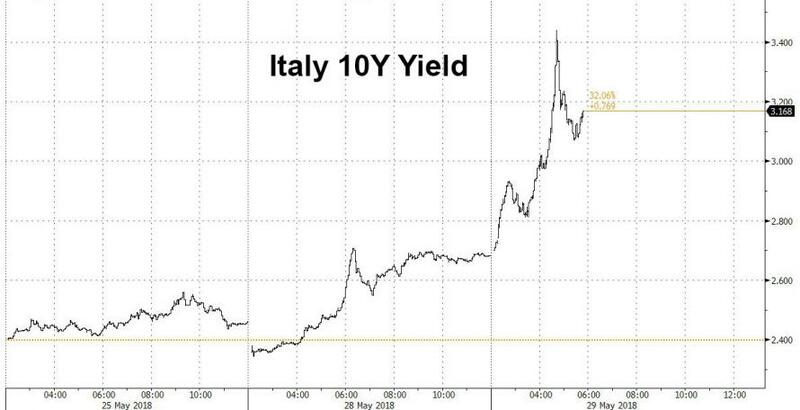 However Italian yields slipped faster than a ball through a Liverpool goalkeeper’s hands as the country’s bond market had a remarkable day. 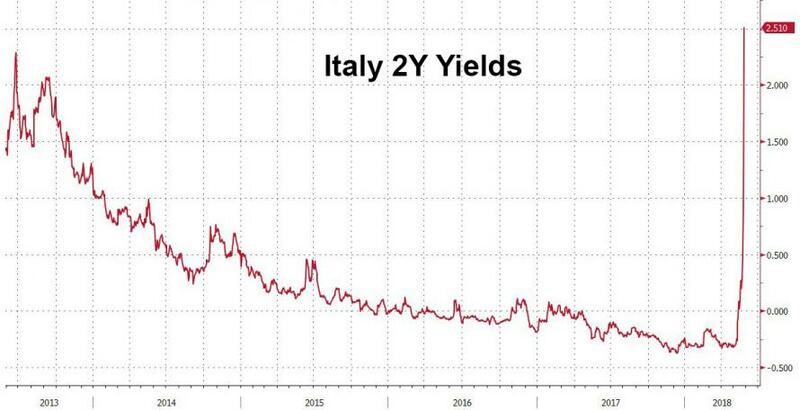 Picture the scene, you are sitting on a European trading floor and as you get breakfast at your desk, Italian 2 year yields have already rallied 21bps to 0.25% after the weekend news that Italy’s President Mattarella blocked the appointment of Paolo Savona as Finance Minister due to his Eurosceptic credentials. On this news the populist coalition collapsed. At that point the market welcomed the appointment of ex-IMF Carlo Cottarelli to run a technocratic administration. However by late morning fears abounded that this could backfire and make the populists even more popular and with more power when fresh elections are held. So within 2-3 hours we were trading close to 0.96% on the 2 year where they stayed for most of the day before dipping to 0.87% at the close. All in all, a 70.7bps range on the day and +40.7bp wider from Friday’s close. To put this in perspective we downloaded the available daily G7 + Spain 2 year yields data since 1986 from Bloomberg to see what the biggest daily 2 year moves have been for major economies. Starting with the Italian 2y BTPs, yesterday’s +40.7bp move was the 13th largest daily move over the past 19 years. Notably, if we exclude the 2011/2012 crisis periods, yesterday’s move was actually the second highest print. Compared to its peers, the change was equally remarkable with Spain having had only 11 days over the past 25 years where its 2yr yields posted larger daily moves than 2 yr BTPs yesterday while the data for the other countries are: Canada 10 days, Gilts 4 days, US and France 1 day, and Germany and Japan zero days. Alternatively, if we assume yesterday’s intra-day move of +70.7bp for BTPs was held into the close, this would be the third equal highest daily change across all of our chosen peers, with the two higher prints being 2 yr BTPs back in November 2011 (+81bp) and 2yr Spanish bonds in July 2012 (+76.4bp). So an extraordinary day and move. Elsewhere, a flight to safety yesterday boosted Core European bonds with Bunds 10y yields down to the lowest in five months (-6.2bp) while OATs also fell -1.5bp. Conversely, peripherals materially underperformed with 10y BTPs up 22.1bp while Portugal (+11.2bp) and Spain (+5.9bp) also rose in sympathy. Meanwhile the spread between 10y Bunds and BTPs are at 233bp, the highest since December 2013. Over in equities, European bourses were weighed down by the Italian uncertainties with the Stoxx 600 (-0.32%) and DAX (-0.58%) both modestly lower. Within the Stoxx, the energy sector led the losses (-0.96%) as WTI oil fell for the fifth straight day (-1.3%; -7.4% cumulative from the recent peak 5 days ago) as Saudi Arabia and Russia both signalled potentially higher oil supply. Across the region, Italy’s FTSE MIB fell -2.08% with Italian banks hit the hardest, as Banca Monte dei Paschi dropped -7.1% while Unicredit and Intesa Sanpaolo fell -3.8% and -3.2%, respectively. Following on with Italy, the latest news is that Cottarelli will need to go to Parliament over the next day or so for a vote of confidence that will likely determine whether we get fresh elections as early as August/September (if he loses) or early next year (if he wins it). The President has determined that this was always going to be a short-term administration so Cottarelli and ministers are not expected to stand in the fresh election. According to DB’s Clemente De Lucia it’s highly likely he will lose as Five Star and League have been saying for a while that they will not support a technocrat government. They reaffirmed this yesterday as did Berlusconi who said his Party will vote against Cottarelli. Indeed it seems Di Maio is intent on mobilising 5SM party supporters as he is calling for a big demonstration against President Mattarella on June 2nd (the Republic Day) in Rome as he noted “I call on citizens to mobilize, make yourselves heard”. Similarly, the League’s Salvini also called for protests over the weekend and said “today Italy is not free, it’s occupied financially by Germans, French and Eurocrats” and that “the upcoming elections will be…a real and true referendum…between who wants Italy to be a free country and who wants it to be servile and enslaved”. In many ways we shouldn’t be surprised by political turmoil in Italy. A stat we regularly discuss is that Italy have had 90 governments in around 116 years. Last week’s nearly Government doesn’t even count here. Speaking to DB’s Mark Wall and Clemente De Lucia last night they believe that the rest of the EU wants to avoid an immediate confrontation with Italy on policy. Europe will wait for a government to be formed and assess the policies it implements rather than escalate tensions on the basis of proposed policy. This avoids giving the populists something to capitalise on. In the meantime, Europe is probably not averse to letting the market express its opinion on the sustainability of the mooted policies as long as the market reaction is controlled, contagion is avoided, and there is no unwarranted tightening of financial conditions. Also Mark thinks the extended hiatus on a political government emerging in Rome means lingering uncertainty elsewhere. This risks complicating the ECB’s path to switching off QE and the EU Council’s plans to gain agreement on euro area institutional reforms this summer. The uncertainty is also an additional headwind to an economic cycle facing more constraints in 2018 than was originally expected. As the cyclical tide goes out, the euro area’s structural deficiencies are being revealed once again. So it’s going to be a fascinating summer for Europe as the Italian political situation crashes into the start of the ECB’s preferred timetable for announcing the exit from QE. Over in Spanish politics now, the leader of the fourth largest party (Ciudadanos) Mr Rivera noted that he won’t back the Socialists Party’s no confidence motion against PM Rajoy for now, but wants PM Rajoy to agree to a new snap election in the fall which would allow an orderly end to the legislature. Elsewhere, the latest poll by El Espanol projected Mr Rivera’s Ciudadanos Party could triple its number of seats to become the biggest party if new elections were held, while support for the ruling People’s Party could collapse and the Socialists Party would be little changed. So this story is bubbling under the surface while the Italian story is truly bubbling above the surface. This morning in Asia, markets are modestly lower with the Nikkei (-0.88%), Kospi (-0.65%), Hang Seng (-0.62%) and Shanghai Comp. (-0.59%) all down. Meanwhile, futures on the S&P are marginally higher while UST 10y yields are c3bp lower. Elsewhere, the US / North Korea’s meeting on 12th June looks to be back on again as President Trump confirmed that “our US team has arrived in NK to make arrangements for the Summit between Kim and myself”. Datawise, Japan’s April jobless rate was in line and steady mom at 2.5%. Now recapping other markets performance from yesterday. The US dollar index firmed 0.18% while the Euro reversed gains of c0.7% to close -0.22% lower to a fresh six month low, as the Italian uncertainties played out during the day. Elsewhere, the Turkish Lira jumped 2.8% vs. USD as its central bank simplified its monetary policy, now allowing its one-week repo rate to be the same as the current policy rate of 16.5%. DB’s Kubilay Ozturk believes the move is a belated yet strong response from the MPC. While simplification is welcome, the team still thinks the Bank will complete its response by re-calibrating its new single rate by (at least) another 100bps along with a shift to a single policy rate on the June 7th meeting. They believe delivering such a response at the MPC meeting would be a major positive. Looking at the day ahead, in Europe we've got April money supply data for the Euro area and the May consumer confidence reading in France due. The ECB's Villeroy is also due to speak again, followed by the ECB's Visco, Mersch, Lautenschlaeger and Coeure. In the afternoon the main highlight in the US will be the May consumer confidence report, while the May Dallas Fed manufacturing activity index and March S&P/Case-Shiller home price index data are also due. Away from that, the OECD conference is also due to kick off (through to Thursday).